Staff Sgt. 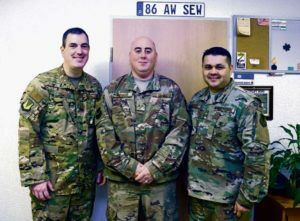 Cody P. Gorman, 86th Airlift Wing Safety Office weapons safety manager, is recognized as Airlifter of the Week by Brig. Gen. Mark R. August, 86th Airlift Wing commander, and command Chief Master Sgt. Ernesto Rendon, 86th Airlift Wing command chief, on Ramstein Air Base, April 4. Gorman was recognized for encompassing Air Force values and excelling above his peers. Staff Sgt. Cody P. Gorman, 86th Airlift Wing Safety Office weapons safety manager, was recognized as Airlifter of the Week, April 4. A hidden hero, Gorman is a critical member of the 86th AW team. As a weapons safety manager, he oversees U.S. Air Forces in Europe’s largest collection of explosive site plans, allocating for the storage of 384 million dollars in combat assets. Gorman’s responsibility doesn’t stop there. He trains 89 additional duty weapons safety representatives to ensure that units follow safety policies and procedures throughout the wing. By constantly striving to improve others, Gorman continuously excels above his peers and encompasses Air Force values throughout his day-to-day life. What separates Gorman from his peers, even more so, is his selfless desire to give back to the community. On top of being an outstanding Airman at the wing safety office, Gorman also routinely volunteers at the Fisher House. He provides meals to dislocated families and ensures the Fisher House’s vehicles are mechanically sound by making repairs. Gorman’s steadfast leadership resulted in recognition through receipt of a 2017 “Weapons Safety Well Done” award. According to his leadership, Gorman is a solution-driven, humble, and excellent example of what it means to be a part of the World’s Best Wing.